A hardness tester with superior design for higher accuracy Rockwell testing. Unique design eliminates frictional inconsistencies. Even tests inside diameters without fixturing. Regular, superficial and combination units available to operate in all Rockwell scales in regular and superficial Rockwell ranges. Available in several capacities. 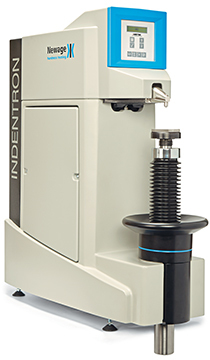 The Indentron Series hardness testers feature an innovative cantilevered indenter configuration that eliminates frictional inconsistencies typical of competitive testing systems. These systems comply with ASTM E-18. Using precision dead weights, the Indentron system ensures accurate and repeatable measurements. The dead weights are used for both the major load and the preload. Automation in the timing reduces the variation introduced by the flow of the material under load. If the operator inadvertently over loads or under loads the preload, the Indentron system prevents the test from being performed. The indenter design is ideal for testing inside diameters and recesses, often impossible with more traditional hardness testers. Inside diameters as small as 1-1/2-inches can be tested with the standard indenter. Optional indenters can test diameters as small as 1/2-inch. Operators can test close to vertical surfaces, to within 1/4-inch with the standard indenter and up to 3/32-inch with optional special indenters. Testing is fast, accurate and there are fewer broken diamonds due to an outstanding viewing area. Two models of the Indentron Series are available- the basic 500 Series and the advanced 600 Series. The 500 Series can be supplied for Regular or Superficial testing while the 600 Series can be supplied for Regular, Superficial or combination testing methods. The Indentron 600 Series features an advanced digital electronics and display panel. Averaging of 2-99 tests, hardness scale conversion, round correction, minimum thickness and time at load are advanced features supplied standard on the 600 Series. An RS232 output can be used to produce X-Bar/R Charts, histograms or integrate to a personal computer with our DataView application software for more detailed analysis. Tolerances may be applied for Pass/Fail or Go/No Go results. Indentron Series can be supplied with vertical testing capacities of 10- or 15-inches. The only contact points in the load system are a set of bearings at the end of the lever beam carrying the major load and a leaf spring at the end of the lever beam carrying the minor load. Most competitive testers use dead weights for the full load due to their accuracy, but use springs to apply the preload. Dead weights are used on the Indentron Series for both full load and preload due to their excellent accuracy and stability under a wide range of conditions. Automation in the timing reduces the variations introduced by the flow of the material under load. The system prevent the operator from completing a test if the preload is over- or under-applied. Request more information to see how we can help you with a Rockwell tester that suits your need. DataView Software Version 1.5.2 28-Feb-17. Improved the roundness correction found in versions 1.5.0 and 1.5.1. Fixed: 1) Removed double roundness correction in hardness measurement, 2) Configured security is re-enabled on restart, 3) Results panel shows 0.0 until all measurements in the group size are read.